Which is the Best Shaving Brush? If you just decided to start wet shaving, then you also need a shaving brush, in order to have the most comfortable experience. You probably wonder which is the best shaving brush. There are many high quality brushes out there, but some are priced unreasonably high, so we left out those products that we thought didn’t have a justifiable price. Yes, many expensive products are of a high quality, but with shaving brushes, functionality and efficiency are two of the most important deciding factors. Why should you complicate things using a brush, you might think at first. Shaving brushes have an important role in the ritual of wet shaving. With their help you can make the lather that you will apply on your face. This process exfoliates your skin and softens your beard and lifts the hairs, so that they’re easier to cut by the blade. Using the shaving brush also helps you distribute the lather more evenly. It really makes a difference to use a shaving brush when you go about your daily routine. Using your fingers to spread shaving cream on your face will matte the hair and clump it. The brush makes everything easier and more efficient. Not having to put so much pressure on the razor will reduce the risk of skin irritation and will produce a better all around result. So, if you want to have a comfortable experience while wet shaving, using a shaving brush is something that you should consider. How many types of shaving brushes are there? You will see further down the page details of the best shaving brushes in different categories. It only depends on your personal preferences, if you want to feel briskness or softness against your face. If you have sensitive skin, then you would maybe want to go for softer bristles, for example. Others may prefer more firm bristles to really open their pores. There are 4 main types of shaving brushes as follows: badger hair, boar hair, horse hair and synthetic. 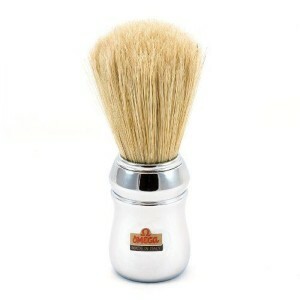 Badger shaving brushes are considered by many connoisseurs to be something like a gold standard in shaving brushes. They have many qualities. Badger shaving brushes are easy to use when making lather. They retain water and lather really well and distribute it across your face equally well. The real difference between the more expensive models and the cheaper ones are certain aspects such as the density of the bristles, where it was made, if it’s handmade or not, if it’s silver-tipped or not. Some people prefer wooden handles. The wood looks really nice and feels nice but is susceptible to rot pretty easily over time. Acrylic handles would be a good alternative in this case. What you must do, though, with any kind is hang it up, because it will not dry otherwise. Badger hair doesn’t dry so fast, it will need some time. It could also have a funny odor at first, but after several usages it will smell like the shaving cream that you use. 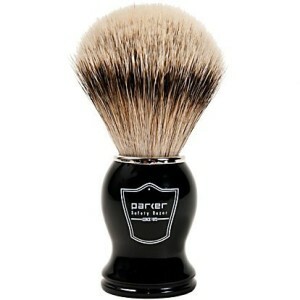 The Parker Silvertip Badger Bristle Shaving Brush is a great choice if you want a quality badger hair shaving brush. It has a good density, nice looks, easy usability and overall offers great value for the price. The specific scent of looks like the main reason why you could focus your attention towards other types of brushes, but boar hair shaving brushes are popular, especially the one we featured from Omega is well rated, not only by us, but by many other people who used this brush. Boar hair shaving brushes are generally more coarser than badger brushes. This is as much an advantage as a disadvantage. Boar brushes have a better form and are better for your skin because it cleans out the pores, unless you have sensitive. And this is the main issue. If you also have sensitive skin, you might feel as if it’s a bit uncomfortable. Certain people who used this brush say that it creates a better lather. On the other hand, other people said that it feels a bit scratchier when compared to brushes with softer bristles. It ultimately comes down to your preference. Another thing you should consider if you choose to use a boar brush is that you have to soak it in hot water for 10 minutes before using it. This means that you will have to plan ahead. But a good thing is that they do soften after using several times. They also tend to lose more hair over time than badger shaving brushes. Anyway, the lost hair will not add up significantly. The main advantage of boar brushes is that they last for a long time keeping a good shape. Among the best boar shaving brushes, the Omega brush has a special place in our opinion. 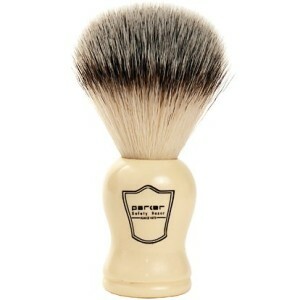 It’s a great choice if you want to go for a shaving brush of this type. Horse hair shaving brushes are not necessarily for every wet shaver. Among the animal hair shaving brushes, they have definitely the strongest odor. The inconvenience may be that it can last for a few days before wearing off. If you have a more sensitive nose, this might be a problem for you, but remember, a problem that will pass in a few days. After that you will see that you own a great brush. The bristles are softer than boar hair but a bit more firmer than badger. You kind of get the best out of both types. The best thing is that, as you will also probably notice, you don’t have to soak them as long as boar hair brushes before their in a perfect condition to be used. If you think about getting one of these, you should know that there are not a big number of options. 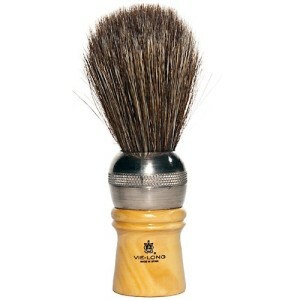 Horse hair shaving brushes are affordable and offer really good value for their price. Among them, the Vie-Long shaving brush we featured is a great choice, a recommendation backed by other reviewers of this product as well. It has a mixed wooden and metal handle which looks elegant and the hair holds its form well over time, offering a comfortable experience when used. Considering the small amount of options when it comes to horse hair brushes, its hard to pinpoint any major differences between them, but we thought this was the one we would choose to be ours from this category of shaving brushes. For those of you who are either animal lovers or have a pretty sensitive nose and can’t stand the odor that some of the brushes made of animal hair have, there is an alternative. Judging from multiple points of view, synthetic shaving brushes are a quite great alternative to those made of animal hair. The best thing is that there are many good models that you can compare if you feel like one of these is the perfect choice for you. Synthetic shaving brushes have the softness of badger brushes but are hold their form slightly better. They don’t have the tendency to be somewhat scratchy like boar brushes. Producing and distributing lather is pretty easy with these brushes. On the other hand they don’t release water as well as badger brushes, but they still get the job done which means you can have a comfortable wet shave. A big advantage of synthetic brushes over animal hair ones is the fact that they dry much faster. The model we featured is, according to our opinion one of the best shaving brushes in its category. Other people have also expressed their positive opinion about this brush, rating it mostly as best.